Carl Zelter wrote to Goethe about her: “. . .[she] could give you something of Sebastian Bach. This child is really something special.” Fanny’s father recognized her talent, indeed believing she was more talented than her younger brother, and educated her along with Felix. She was probably also encouraged, or at least inspired, by her two great-aunts: Fanny von Arnstein, patroness of a well-known salon, and Sarah Levy, an accomplished keyboardist who owned a collection of Bach manuscripts. We can assume Fanny also had the support of her artist husband, as she continued to perform in the Sunday afternoon concerts at her family home and even gave her only known public performance (of one of her brother’s piano concertos) after her marriage. Her brother had a collaborative relationship with Fanny. She critiqued Felix’s music before publication and he published some of her pieces under his name. He once wrote, “From my knowledge of Fanny I should say that she has neither inclination nor vocation for authorship. She is too much all that a woman ought to be for this. 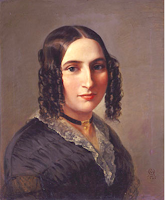 She regulates her house, and neither thinks of the public nor of the musical world, nor even of music at all, until her first duties are fulfilled.” Since Fanny wrote over 460 pieces of music, I have to assume that Felix was wrong. While Fanny was dusting cobwebs and polishing silver, she must have been creating music in her head, perhaps humming to distract herself from tedious work? Felix added, “Publishing would only disturb her in these [her wifely pursuits], and I cannot say that I approve of it.” Was he jealous of her? That is hard to say, but he was attached to her. Fanny died of a stroke when she was forty-one and Felix died six months later. Just as Felix Mendelssohn revived Bach’s music, the record labels Hyperion and CPO are now reviving Fanny’s. Their release of her compositions in the past years, as well as scholarly research on her creativity, may liberate her from history’s indifference.